White Paper Abstract: Digital health, also called ‘connected health,’ leverages technology to help identify, track and manage health problems and challenges faced by patients. By now, most Americans have used at least one digital health tool, according to a 2015 Rock Health survey. In a nod to the device-driven lives of patients and health plan members, healthcare organizations are slowly layering digital health tools over care delivery and management efforts. And as they do so, the principal goal of digital health programs, according to one-quarter of respondents to a 2016 Healthcare Intelligence Network survey on this topic, is to boost patient satisfaction with the healthcare experience. To this end, 70 percent of respondents have adopted a digital health approach, the survey found, with more than a quarter—27 percent—engaging between 10 and 25 percent of their population in digital health. 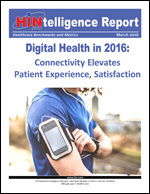 Download this HINtelligence report for more data on fostering engagement with digital health tools and the health metrics most often monitored digitally.